Naturally, just as we rounded up the complete list of Apple TV channels, Cupertino added a few more options to its set-top box on Tuesday. Alongside a new app for the premium Showtime network, the company also launched a channel for content from its own annual iTunes Festival. 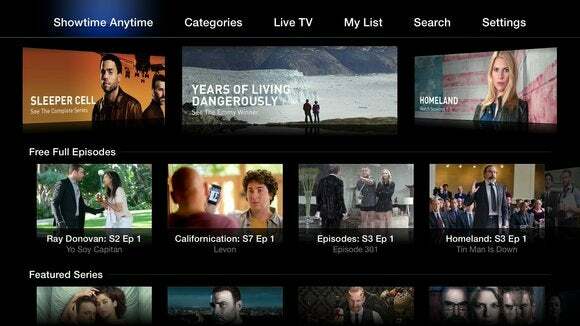 The Showtime app, much like that of rival HBO, offers a catalog of movies and the company’s own original programming. In an unusual move, however, the app also boasts the ability to watch live TV, letting subscribers flip over to whatever’s currently airing on either Showtime East or Showtime West. You can also get a look at what’s coming up on the channel later in the day or week. Of course, in order to actually watch any of the content, you’ll have to authenticate with your TV provider—sorry, cord cutters. 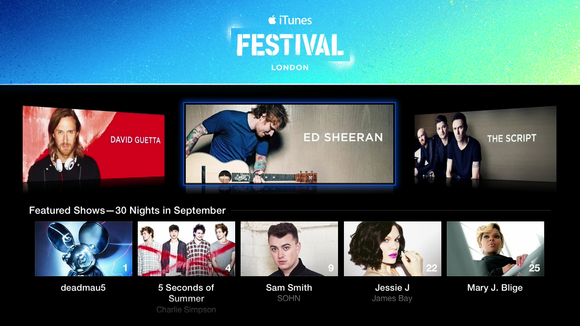 Music fans don’t have to suffer any such indignities at the hands of the iTunes Festival channel. Apple’s own channel lets anybody browse through the list of artists performing at the annual concert, which kicks off on September 1 and runs throughout the month at London’s Roundhouse. You can view the entire lineup and read profiles of the various musicians, as well as—of course—take a look at their albums for sale in the iTunes store. Each artist’s page also gives you a countdown timer to let you know exactly how long you have before they take the stage. You can also view photos of previous festivals and, of course, you’ll be able to eventually stream the performances live or on-demand. Apple also rolled out a couple of smaller video channels internationally: Mac1 reported that NRK, the Norwegian public TV network, is now available to Apple TV owners in Norway, and its Swedish counterpart, SVT, announced that it too is now on the set-top box. Those join more recent international channels like TV 2 Sumo and Esporte Interativo, which Apple rolled out last month.